You never know when perspiration can occur. So Dry Idea® antiperspirant is specially formulated to keep you dry... no matter what. 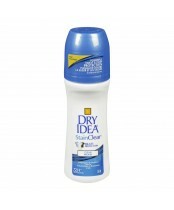 Dry Idea® roll on contains no water, which leads to its signature dry feel. Dry Idea® antiperspirant roll-on uses a unique combination of ingredients to block sweat without the use of water. That's why it's your best choice for no sweat.